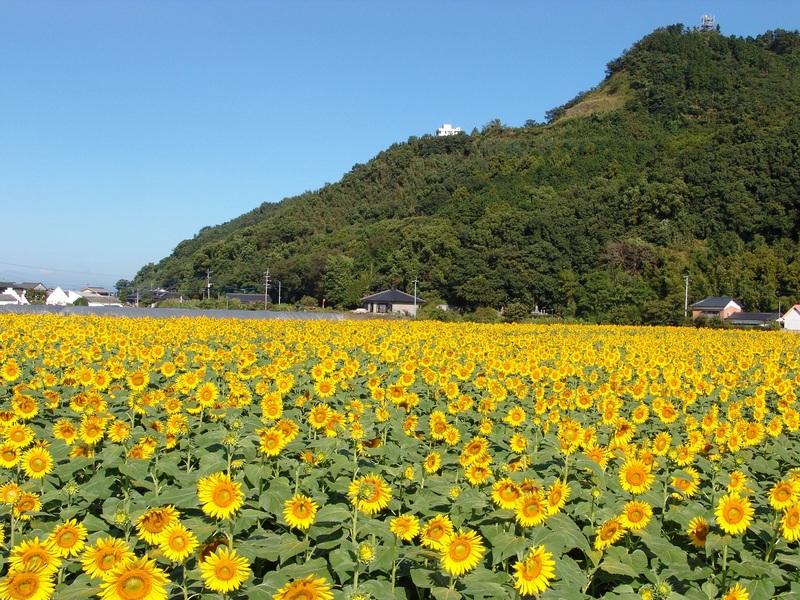 Taken at the Sunflower Festival in Asakura, Fukuoka, last month. There were about 160,000 sunflowers in the field. Clicking on the photo enlarges it nicely. SOMETIMES it’s the observation of small matters that leads to the recognition of big differences. The contrast of those big differences sometimes leads to a recognition of the nature of that which is being contrasted. The American giant Starbucks has caused heated discussion in China over whether it is appropriate for the world’s largest Western coffee shop to set up in the Lingyin Temple, a Buddhist monastery in Hangzhou, East China’s Zhejiang Province. The Sina Weibo account of the company’s stores in Shanghai, Jiangsu and Zhejiang provinces announced Friday that it would open a shop in the monastery on Saturday. The news was reposted over 4,000 times with many biting comments about the odd combination of the modern commercial shops being set up in ancient temples. A Weibo user said it creates an odd juxtaposition to drink coffee in a setting meant for meditation, as Starbucks symbolizes foreign culture and Lingyin represents traditional Chinese culture. Another user complained that even religious sites are not immune from the invasion of foreign culture. “The new coffee shop is located outside of the central scenic area requiring a 20-minute walk,” a staff member surnamed Wang with the management office of the temple told the Global Times, adding that Starbucks has met all the strict requirements the management office sets for commercial establishments. “The scenic spot’s management office should do its research before opening a foreign brand store at a cultural heritage site,” Zhang Yiwu, professor with the Department of Chinese Language and Literature at Peking University, told the Global Times, adding that finding a balance between Chinese culture and commercialism is critical. Editor’s note: In addition to being a huge waste of money, Starbucks is seen by many traditional Chinese as being a culturally invasive. In case you were born yesterday, Chinese people have always drank tea, NOT coffee. It would be a shame for China’s beautiful tea culture to disappear and be replaced by a less sophisticated, coffee. Perhaps it wouldn’t be so bad if Starbucks coffee weren’t so darn expensive. If China’s several millennia of beautiful tea culture were to be supplanted by the invasion of that crude and barbaric beverage because there are now more than 570 Starbucks outlets in a country of 1.3 billion, it might be because more people wanted to drink coffee than tea. It also might be because Starbucks saw the opportunity to create a new market and took advantage of it. Odd how little confidence the editor has in China’s cultural resilience, despite the confidence he has in its superiority. And the price of Starbucks products is a matter between the company and its customers. If they’re too expensive or culturally insensitive, drink all the tea in China instead. That’s how free markets work. (It) should indeed be required reading by every Chinese for its poignant and critical analysis of Nationalistic pride and misguided views about Japan. It should also be read by foreigners to de-jade them of the opinion that all Chinese think using a sliver of the perspective that the world at large holds. That bitter part of Sino-Japanese history is just one shadow cast in the two-thousand-year history of Sino-Japanese relationship. It is not everything. The future will be even longer. We cannot keep repeating that the Chinese language is the ancestor of the Japanese language, wanting the Japanese people to be the descendants of the 3,000 boys and girls that could not find the magical eternal-life potion for the First Emperor of Qin, or forgetting (or even being totally ignorant) of the contributions that Japan has made towards China. Admitting someone else’s good points does not mean that you are deprecating yourself. On the contrary, it is an expression of self-confidence. The attitude from the western multinational corporate mouthpiece reminds us all that Starbucks must in fact be boycotted, otherwise this kind of arrogance, and hostility will continue, as these writers cannot survive without funding from western multinationals. If you consider yourself a person with honor, you ought to also boycott websites such as danwei, and imagethief. and inform others of their malicious agenda….Maybe the time has come to stop whoring out our land, and put heavy restrictions on western multinationals. If we want to protect our culture, then Mcdonalds, KFC, Carefour, Jack Jones, Uni Qlo, all must be limited, not only Starbucks. If the corporate mouth pieces insist on slandering the Chinese people, Chinese culture, and the Chinese government, then it is certainly fair game to turn up the heat on western multinational corporations. What goes around, comes around. Why yes, they do want to exact revenge on everyone who mistreated them for the past 150 years. Didn’t you know? Trade, even when it supports choice and diverse achievement, homogenizes culture in the following sense: it gives individuals, regardless of their country, a similarly rich set of consumption opportunities. It makes countries or societies “commonly diverse,” as opposed to making them different from each other…. Cross-cultural trade does not eliminate differences altogether, but, rather, it liberates differences from the constraints of place. ….and gives the natives who don’t appreciate the loss of illusory control in a world they no longer understand something to rail against with charges of “American Cultural Imperialism” (for example). The editor at this site isn’t an outlier, if that’s what you’re wondering. The Chinese expressing views such as these in English have become a presence on the Internet. Starbucks Japan announced they will open a shop on the sando, or approach path, to the Dazaifu Tenman-gu Shinto shrine on the 16th. 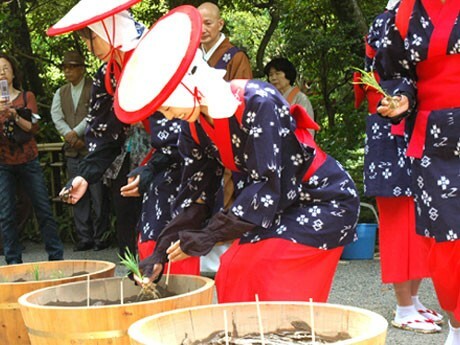 It will be the first Starbucks shop at a shrine or Buddhist temple. 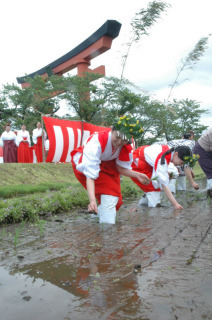 The Tenman-gu shrine is a large facility with gardens containing 6,000 plum trees in addition to the buildings. A Shinto shrine was first built there in 905, and the current building, registered as an important cultural property, dates from 1591. It was built on the grave of Tenjin, the deification name of Sugawara no Michizane, renowned for his erudition and learning. They’re opening the Starbucks at just the right time, too, as tens of thousands of people will visit the shrine for New Year’s. The visits will continue into January as students make the pilgrimage to ask the deity for a blessing to pass their high school or university entrance examination. 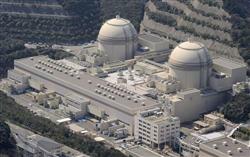 Another attraction, the Kyushu National Museum, is within walking distance nearby. The location demands that this shop not resemble the typical shopping mall Starbucks. It was designed by University of Tokyo architect Kuma Kengo, known for his work on the Suntory Museum of Art and the Nezu Museum. That design combines the traditional and the modern with natural materials, primary among which is 2,000 pieces of Japanese cedar obtained by thinning out forests. It will also have two gardens, one in front facing the sando and one inside with more plum trees. There will be 46 seats in the interior and 10 on the terrace. The post includes a photo of the interior and a 10-minute YouTube video of the street where the shop is located and the grounds of the shrine itself. 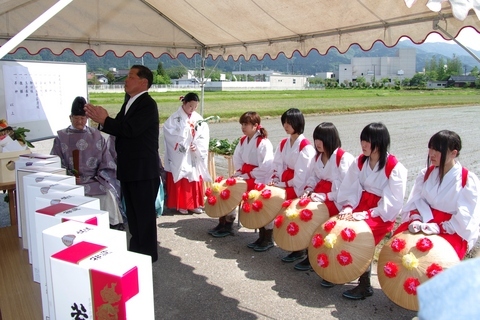 The Dazaifu shop opening was a news item on the day it was announced, but people have since forgotten about it. If anyone complained, it escaped my notice. Starbucks Japan has 955 shops in Japan, according to their website. 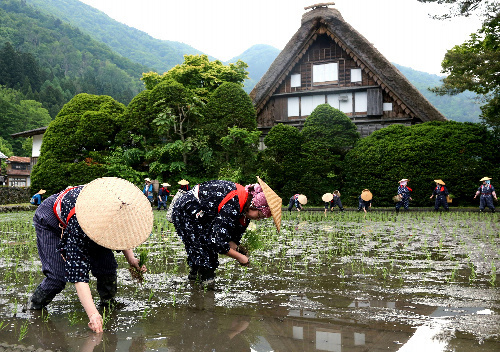 Yet Japan’s beautiful tea culture is still thriving. 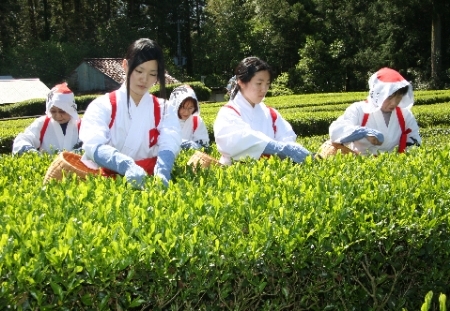 Even young people, mostly women, practice the tea ceremony. They have clubs in high schools and colleges. And when they open a Starbucks near a Shinto shrine, they make sure it harmonizes with the neighborhood. Some people are adaptable and are the stronger for it. Some people are rigid and are the weaker for it. Some people in the West get all warm and fuzzy and why-can’t-we-get-along about the Chinese. Some, such as the New York Times’ Thomas Friedman, are openly envious of their political and social systems. Which part of those systems, exactly? 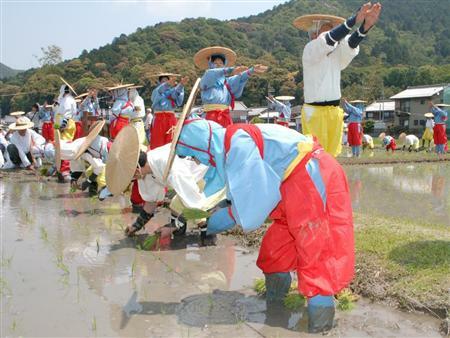 As their own name for themselves indicates, these folks believe they’re the flower in the center of the world. You know what that makes us. The website says there are 200 Starbucks outlets in China. There were 570 as of May. Mr. Rui said China was the second largest global market. There are more than 955 outlets in Japan. There’s no need for me to make pithy comments when I know you’re thinking plenty of pithy thoughts on your own. Whoops Mr. Moto, I’m a coffee pot. 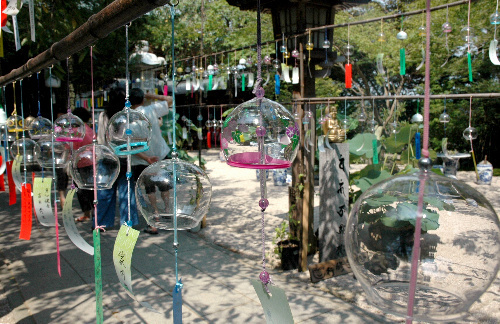 Some of the 600 wind chimes at the Nyorin-ji Buddhist temple in Ogori, Fukuoka. The chief priest, Haraguchi Genshu, started hanging them five years ago. Worshippers pay JPY 500 and attach a written wish to the chime. They’re moved inside the temple at the end of September. 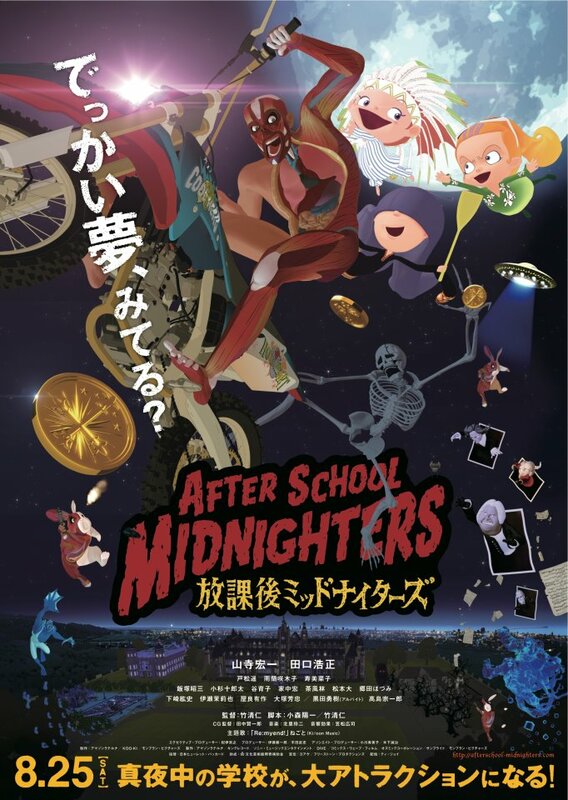 CARTOONS sure ain’t what they used to be: The anime feature After School Midnighters, directed by video creator and Fukuoka City native and resident Takekiyo Hitoshi, will premiere in about 100 theaters next month in Japan, South Korea, Hong Kong, Taiwan, and Singapore. The anime is a comedic film about a human anatomical model and some mischievous students at a night school. It was produced with computer graphics, and it employs motion capture technology, in which the recorded movements of people are used to create digital character models in computer animation. The movie’s creators filmed a drama troupe in Fukuoka for the motion capture. Fukuoka City resident Komori Yoichi, the man behind the popular Umizaru manga series, worked on the script. Screening begins in Japan on 25 August. Here is an interview with the director, who says the film is a feature-length treatment of a six-minute short that was picked up by Canal+ in France in 2007. Mr. Takekiyo also explains how it’s no longer necessary to live in Tokyo or other big cities to do important work. And here is the official site in Japanese with the theaters showing the film and official trailers. Residents of South Korea, Hong Kong, Taiwan, and Singapore will have to check local listings! WHEN the heat begins to strain the limits of tolerance in east coast cities of the United States, municipal officials sometimes turn on the fire hydrants to let children frolic in the spray on the sidewalks and among the muck in the gutters. 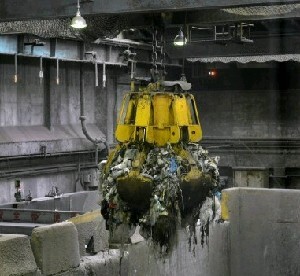 The Japanese have a similar custom, but take a different approach. 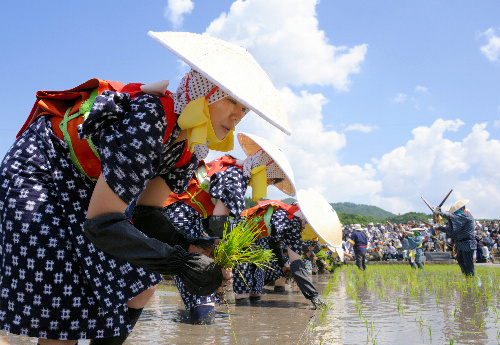 Summer heat here can be quite intense, particularly after the rainy season ends, as it did last week in Kyushu. I’ve often thought it would be a good idea to import the custom of early afternoon siestas, starting at my house. 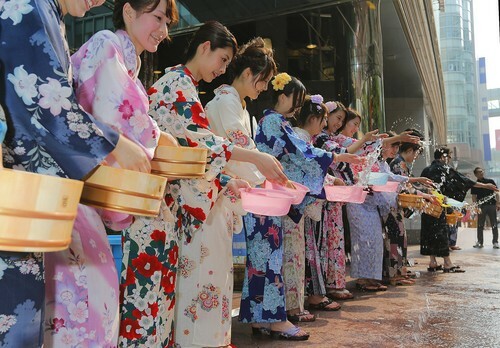 The local solution is to dress up in yukata, line up on the streets, and splash them with water using the small bucket/scoops that are an essential part of the bath. 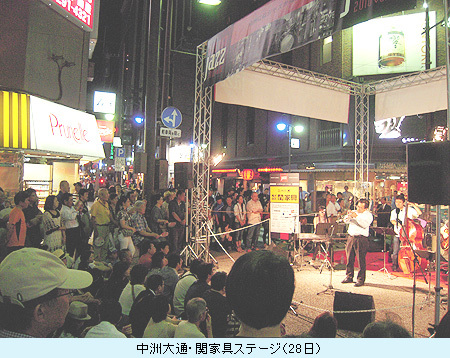 Events such as these are conducted in cities throughout the country, and on the 25th it was held at 30 locations in Fukuoka City. 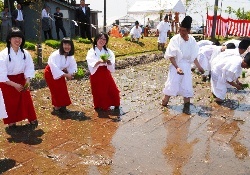 Media attention focused on the splashing in the Tenjin commercial district, Kyushu’s largest. It started late in the afternoon at City Hall on a day that reached 33.9° C (93° F), and they splashed in a relay, moving from block to block. 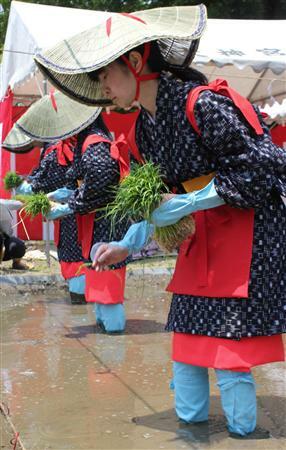 As many as 200 men and women participated at Tenjin, and shop clerks, staffers, and passersby also got into the act. Other attractions included entertainment, stands selling sno-cones (that’s shaved ice for the linguistically fastidious) and other cooling refreshments, and ice sculptures. 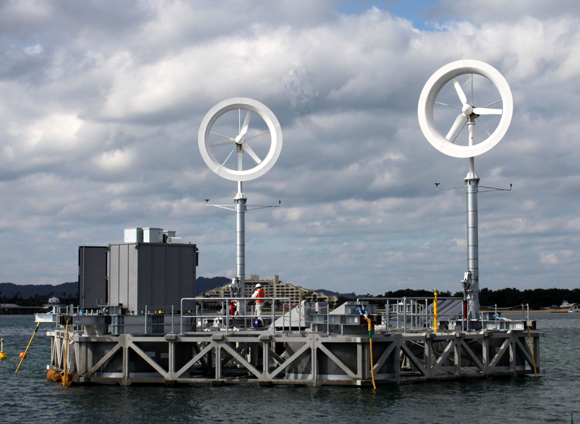 Greenbird Fukuoka, the NPO sponsoring the sprinkling, said the objective was to promote energy conversations, but that’s the sort of thing an NPO says out of a sense of duty. Everyone knows the real point is to have fun and create a shared experience while forgetting the thermometer at the same time. The effect is more than psychological. The evaporation of water also eliminates heat, and reports say temperatures in the splashed districts fell two degrees by the time it was over. Here’s what it looked like in Tokyo’s Ginza district four years ago. That boy who dumps some water over his own head halfway through has the right idea! THE Fukuoka City-based Nishinippon Shimbun conducted a questionnaire survey of opinions on political conditions from 17-22 May. The location of the survey, the persons surveyed, and the questions asked make the survey results essential reading for anyone interested in the mood of the Japanese electorate. First, they limited the survey to those people who voted for the Liberal Democratic Party in the lower house election of 2005, and who also voted for the Democratic Party of Japan in the lower house election in 2009. In other words, these people voted to support the Koizumian reforms and Japan Post privatization, and to repudiate the LDP after the party had repudiated the work of Mr. Koizumi. Thus, the survey focused on independent voters whose primary interest is in systemic reform, which was the primary issue in both of these elections. The DPJ victory had little, if anything, to do with the content of the party’s election manifesto other than their promise to implement real reform. The voters just as quickly repudiated the DPJ when they discovered that promise (and everything else they said) was nothing more than campaign shouting. 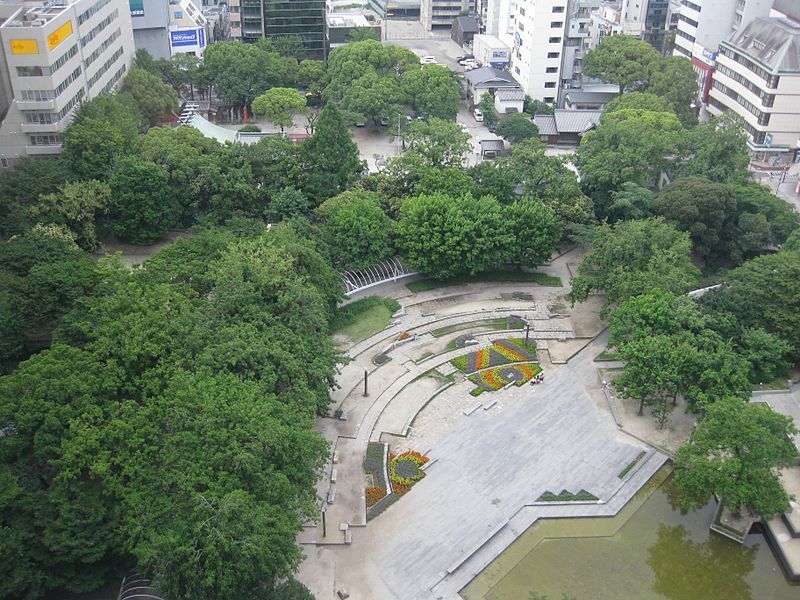 Two of the areas covered in the survey were the respondents’ current political preferences and their views of Osaka Mayor Hashimoto Toru and his One Osaka reform movement. It was therefore a quick and dirty indicator of what people in Kyushu’s largest city thought of the Osaka-based phenomenon. Among the reasons cited by the people in the last group were: “There are no real politicians in Japan now,” and “I might not vote in the next election”. That tends to confirm the results of the Jiji news agency polling since the early 2000s that “non-aligned” is the default position for a majority of Japanese voters. (Jiji’s polls are conducted by their market research arm, and are considered more accurate than the other media polls, which use random digit dialing.) This group starts gravitating toward a party or candidates shortly before an election, and gradually reverts to their independent position after an election. Finally, the survey asked whether they had positive expectations if One Osaka and Mr. Hashimoto were to establish a national presence. Of the 100 people surveyed, 74 answered yes. To be sure, this poll was unscientific; the newspaper admits upfront it was conducted on the street. 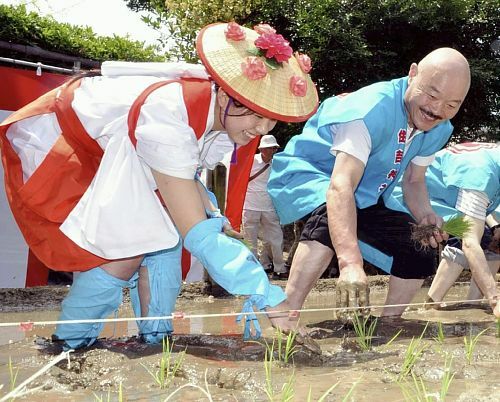 But it doesn’t take science to realize that the super-sized political tsunami rolling towards Nagata-cho is going to turn the political careers of quite a few people into flotsam and jetsam.